Last week we looked at the bridge over Coral Canal along the perimeter of the lagoon in Venice, California. Now we're back to take another view of that waterway, using post card images and a current-day photo for perspective. 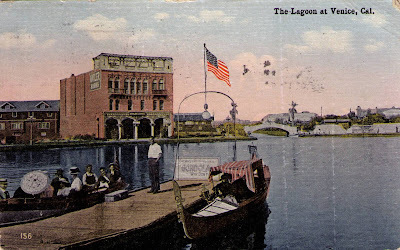 Here's the first postcard: The bridge in the background is not the Coral Canal bridge, although it is similar - the canal directly behind the gondola is Lion Canal. If we could look further to the right, we would see Grand Canal, and over to the left, just outside of the shot is Coral Canal. The large building behind the man on the dock is the Antler Hotel, which is said to have housed a speakeasy in it's basement during prohibition. Looking from right to left, we see Grand Boulevard, which used to be Grand Canal. To the left of Grand Blvd/Canal, is Lion Canal, which, by the way, is now Windward Avenue. Finally, to the left of Windward Avenue is a restaurant with green awnings, where the Antler Hotel once stood. Now let's check out the gondola from that postcard. The postcard was stamped in 1915, although there's no telling how much earlier the image was captured. The gondola has a canopy which consists of a lightweight frame with draped cloth. It looks an awful lot like the "felze de tela" canopies I've seen in old photos from Venice, Italy. The ferro has five fingers; something seen more often a hundred years ago. 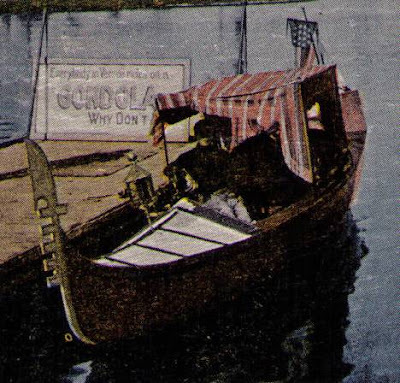 The foredeck has diagonal trim pieces, another feature which indicates that the gondola may have been relatively old when this image was captured. 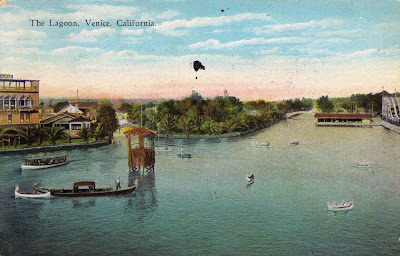 The foredeck also appears to have been painted white - something fairly unique to gondolas in Venice, California in the early part of the twentieth Century. Wanna see that sign on the dock? I've got one more postcard for you to look at in this post. It's a wider view, taken from a slightly higher vantage point. Again, Lion Canal on the left, and Grand Canal on the right. I think the structure in the water that looks like a huge duck-blind is a lifeguard stand. There is one more thing in this image that deserves attention. Actually it deserves it's own post. There's something very wrong about the image. I'll publish another post on it. 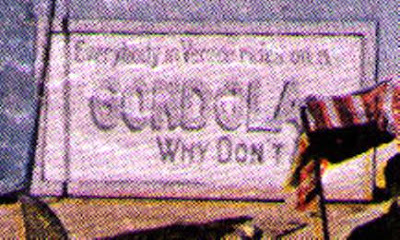 The gondoliere is standing on the foredeck of the gondola, rowing backwards on the wrong side of the boat. It could hardly be more wrong. The photo (if it ever was a photo and not a drawing) might have been retouched before printing, moving the gondoliere to the other side of the boat, maybe to adjust the composition a bit. You win...well, there's really nothing to win...but you are correct! I believe that postcard was a retouched photo (quite common back then), and whoever re-touched it decided to put a gondolier on a boat that was at anchor. I get a bit sad when I see your "then and now" pictures. Venice CA seems to have been quite a nice place, even if artificial from the beginning, but the "now" pictures look like just about any other town. Venice CA seems like a place which has had a quite distinct character and identity, but it also seems like it has lost it completely. I'm left with an impression of a place that has somehow been reduced. Unfortunately, you are right René. I get sad just looking at the current photos. What's worse is that some parts of Venice, California are no longer very safe. It was an amazing place for a short time, and while it's canals have been filled, buildings replaced, and most of the bridges torn down, the influence of Venice, California can be seen in many places. There is a small network of canals still there, which I will cover in a future post. Speaking of Los Angeles and gondolas with canopies, have you seen the gondola with a canopy that operates out of Marina Del Rey? I was there the other day and checked it out on the dock. There's a great story there. Ask me about it at the next Sunset Gondola event.